Viking Settlement of North America, 1000. 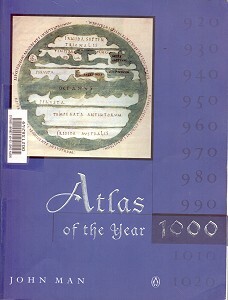 Man, John: Atlas of the Year 1000. Penguin Books Ltd, 27 Wrights Lane, London W8 5TZ, England. Penguin Books Australia Ltd, Ringwood, Victoria, Australia, 1999. Further west, other Norsemen were already building another outpost. From reports by storm-driven sailors, the Icelanders knew of land some 280 km (I75 miles) to the west almost as soon as they settled in their new country. ... Norwegian outlaw who found it was fit for habitation. Erik (or Eric, or Eirik)Thorvaldsson, nick- named Erik the Red, was not a man to cross. He had been brought to Iceland by his father, who had been outlawed from his native Norway for murder. Erik clearly inherited his father's violent tendencies. So dedicated was he to feuding- he had his slaves engineer a landslide to flatten a neighbour's farm - that he was himself outlawed for three years. He decided to explore the unknown icy land to the west. As it turned out, it was rather less icebound than it is today. Erik rounded the point now known as Cape Farewell in 983, and to his astonishment discovered fjords, kept ice-free in spring and summer by a finger of the Gulf Stream current. Here were grassy slopes, bears, foxes, caribou, fish- and no inhabitants. The place was his for the taking. For three years, he and his crew explored. Returning, he painted a glorious picture of a place ripe for colonization. To enhance its appeal, he called it Greenland. This was good news for his countrymen, for they had just come through ten years of famine, and in any case their habitable patches were all occupied. In 986, 25 ships set out for the new land. It was a rough trip. Only 14 survived the journey, landiing some 350 people around today's Julianehab, the area they would soon call the Eastern Settlement. Here Erik and his wife and three sons settled in a fjord named after him, on his farm Brattahlid. By 1000, some Norsemen had pushed 500 km (300 miles) north to today's Godthab (the Western Settlement) and grown to some 1,000 strong. The two communities were exporting furs, hides, woollens, and narwhal and walrus tusk in exchange for corn, iron, timber and clothes they needed from Iceland and Norway. This was the beginning for the communities that would eventually have outposts another 650 km (400 miles) to the north. They were to live well for over 200 years. But then the climate turned harsher, crops failed, ice increasingly hemmed them, and hostile Inuit moved south- wards. When one last ship called in 1540, the crew found only deserted farms, and one unburied body. Geoff Cater (2016) : Viking Settlement of North America.